Nabbing a home right on the water is the ultimate dream for any ocean lover. And for homeowners Christine and Jay, that dream was finally a reality. But as the couple’s backyard illustrated, years on the water can wreak havoc on a home. 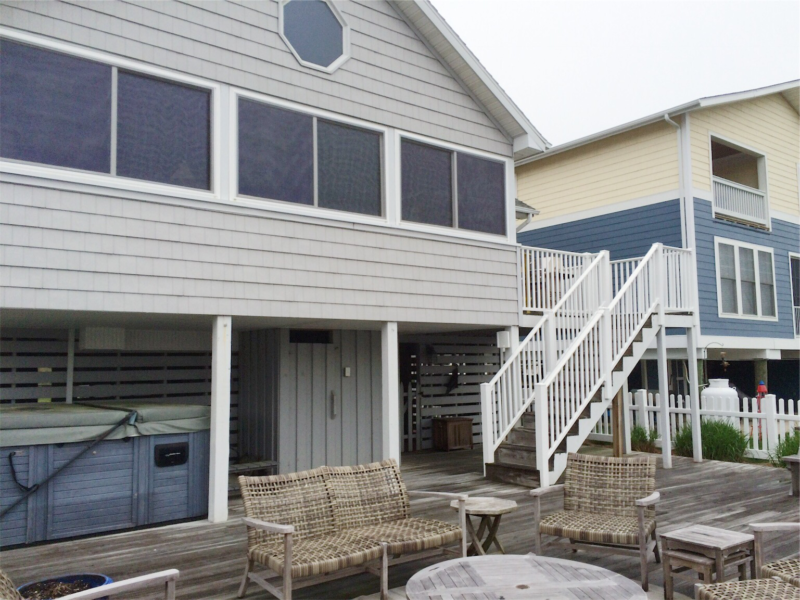 Many seasons of salt water, storms, heat, and high tides had nearly wrecked their deck, making it a run-down space that they rarely used. 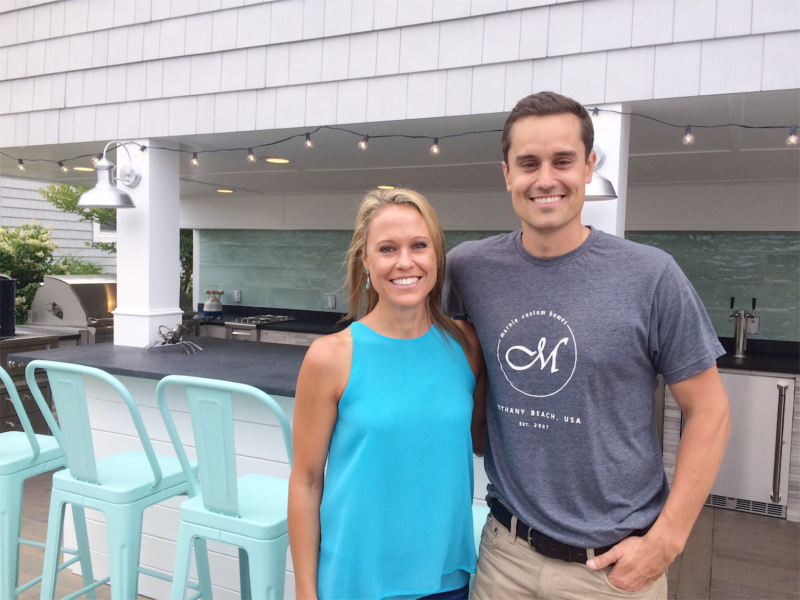 This water-loving couple longed for a backyard that would allow them to take advantage of waterfront living. When they first purchased the home, their children were still young. Now that their kids are all grown up, Chris and Jay wanted an outdoor space that their children would want to hang out in. They dreamed of parties and get-togethers with family and friends, meals under the stars, a little privacy to enjoy their hot tub, and a place to create memories with their kids. 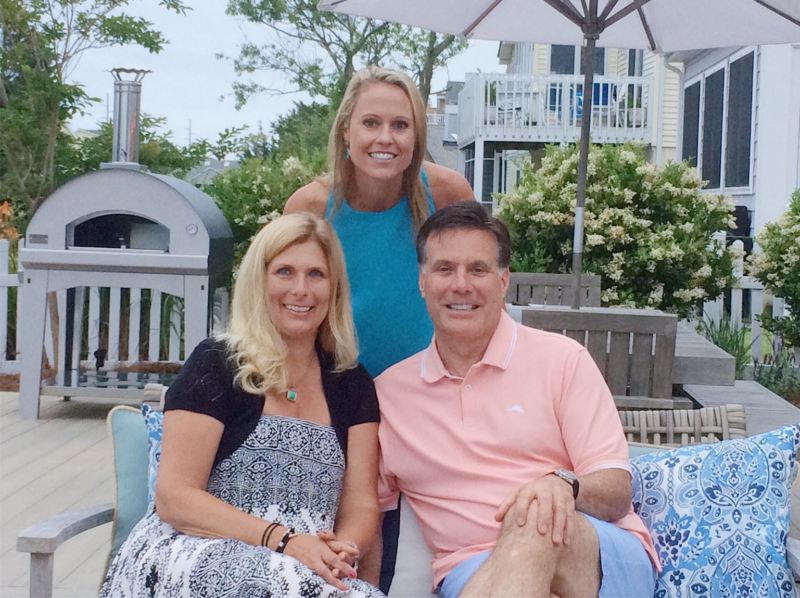 After all, outdoor living and time spent with family is what summers at the shore are all about! 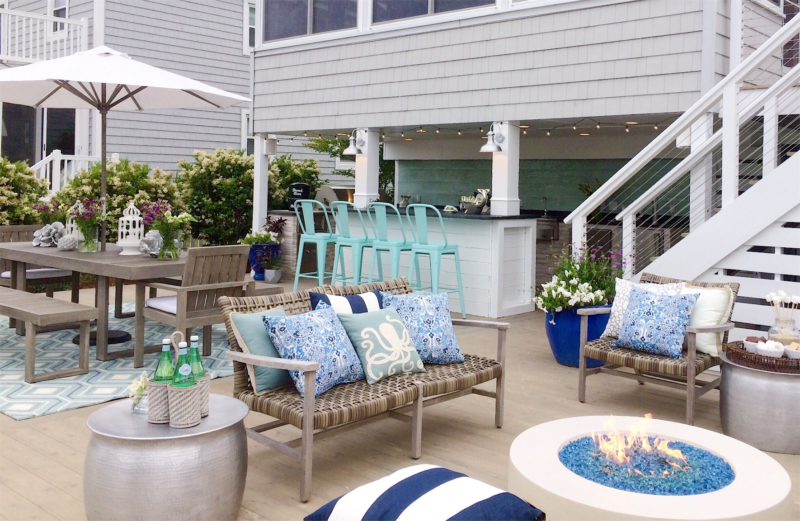 Chris and Jay had the space and a vision, and it was up to me to bring the back deck of their dreams to life. From a purely aesthetic perspective, the deck lacked color, personality, and creativity. It was a blank canvas that was functional, but certainly not inviting. 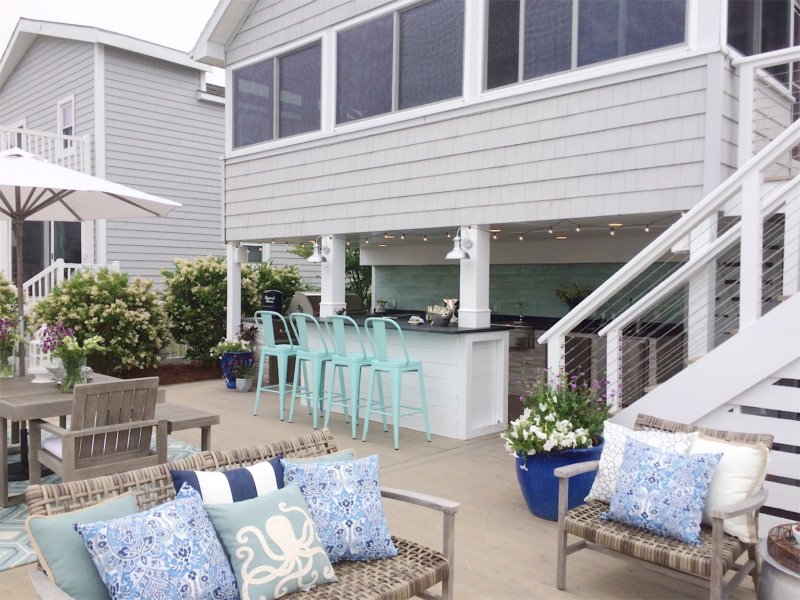 The deck desperately craved some life and a beachy outdoor oasis vibe. But the issues went far beyond just looks. Living on the water is one of life’s purest pleasures, but it doesn’t come without peril. Water levels are unpredictable, and Chris and Jay’s deck was often covered by water when it stormed. 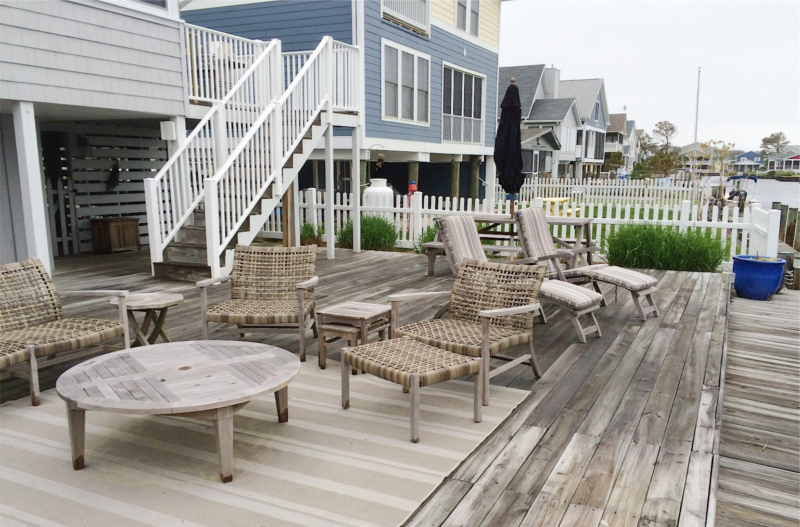 Additionally, the salt air and water, high winds, humidity, hurricanes, hot summers, and cold, snowy winters all took their toll on the couple’s deck. Years of water damage and exposure to the elements had made much of the structure unsound. Functionality was another issue. The hot tub and shower were right out in the open, offering no privacy. The grill was located one level above the lower deck, leaving whoever was cooking out of the action on the deck below. And the lack of distinct zones made this large space feel empty and unwelcoming, leaving Chris and Jay uninspired to use their backyard as often as they’d hoped. The first and most important task we tackled was reinforcing the joints of the deck to stand up to rising water. Once that was completed, we created a new cedar deck. 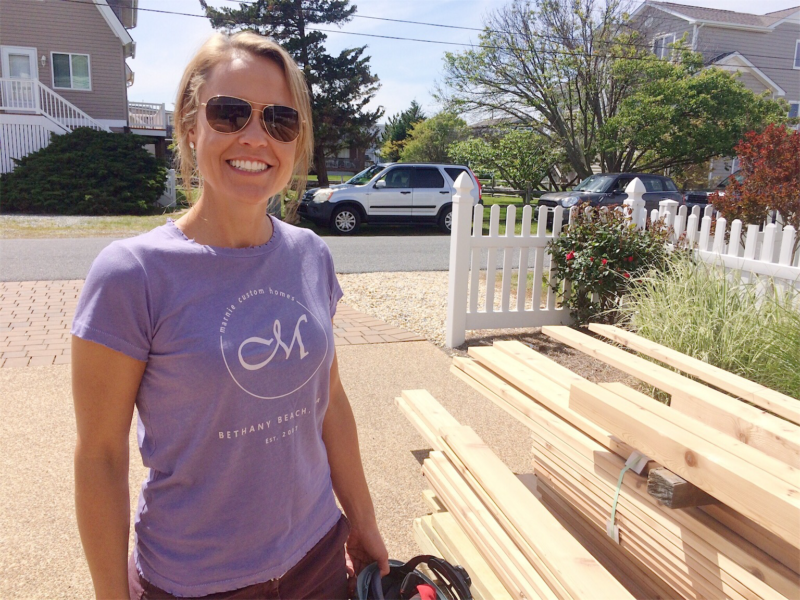 Not only is cedar gorgeous and economical, but it’s also incredibly durable and sustainable, too. Cedar weathers beautifully and maintains its toughness for many years of harsh elements (it can last about 15 years without being power-washed or resealed!). We also created plenty of room for ventilation underneath the deck for when the water inevitably rises. 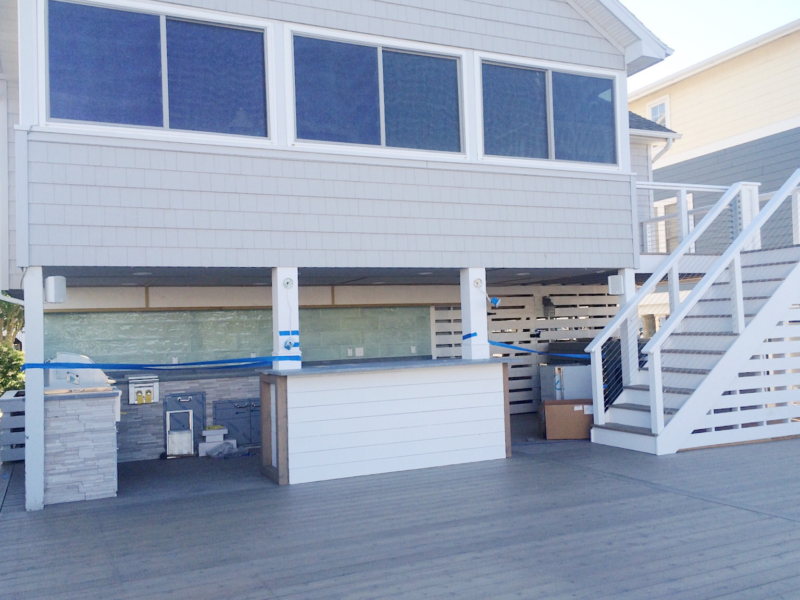 Lastly, we stained the deck light gray to give the space the coastal feel the couple wanted. Next up was the staircase. Stairs are much more than just a functional element – they’re also an architectural one that can make a bold design statement. To create that beautiful element for Chris and Jay, I finished the staircase with horizontal slatting. I then used a skirt board to conceal the edges of the treads and risers. Not only does the new staircase add visual interest to the backyard, but it also creates privacy for the hot tub, which we moved behind the stairs. I also moved the outdoor shower to the side of the home to make way for the new kitchen and create more privacy. There was plenty of room here for a shower, a changing cabana, a sink, and storage, which made this area feel indulgent, yet coastal casual. 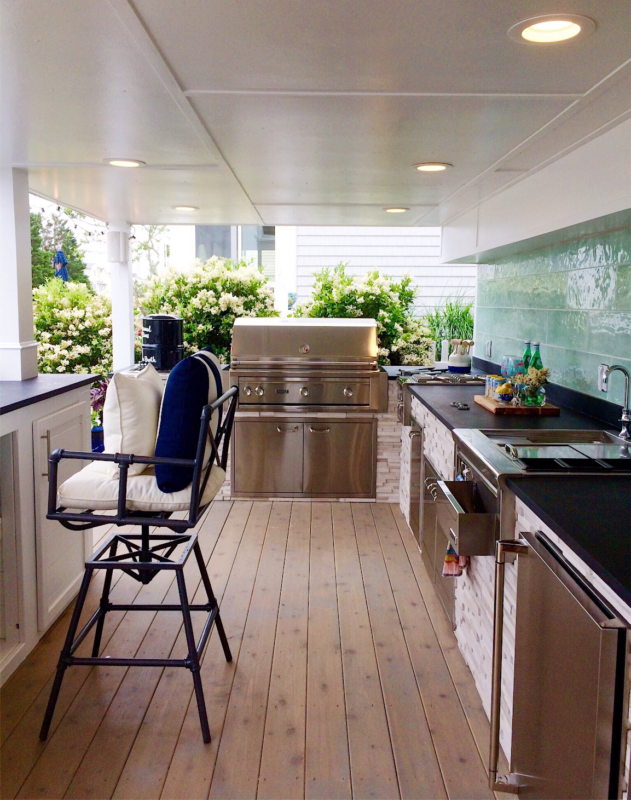 Any backyard space benefits from having an outdoor kitchen, but when you live on the water, it’s practically a prerequisite. 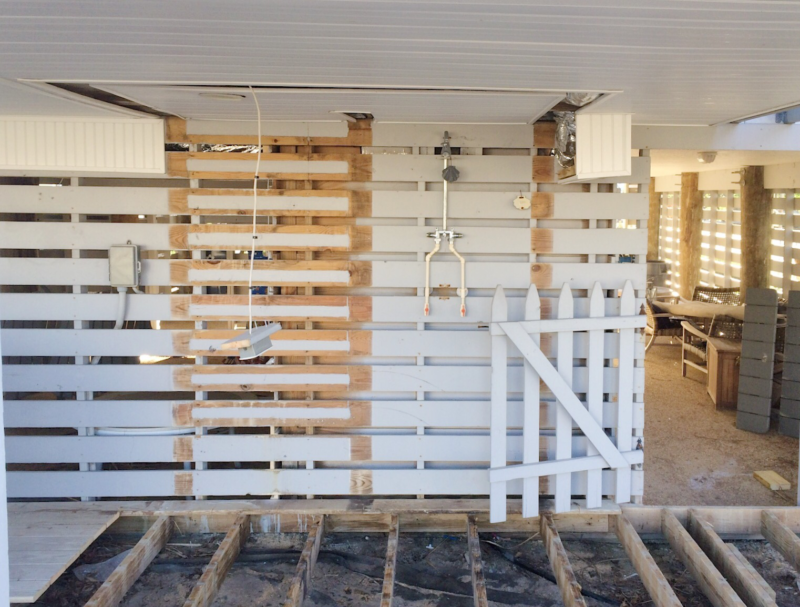 To provide protection from the elements, we installed the kitchen underneath the home’s overhang where the hot tub and shower had once been. The addition of a bar/counter area created a whole new hangout area that the space previously lacked. We hung fire-resistant fiber cement board on the ceiling of the kitchen and cut holes for additional lighting. Wow – it’s hard to believe this is the same space! 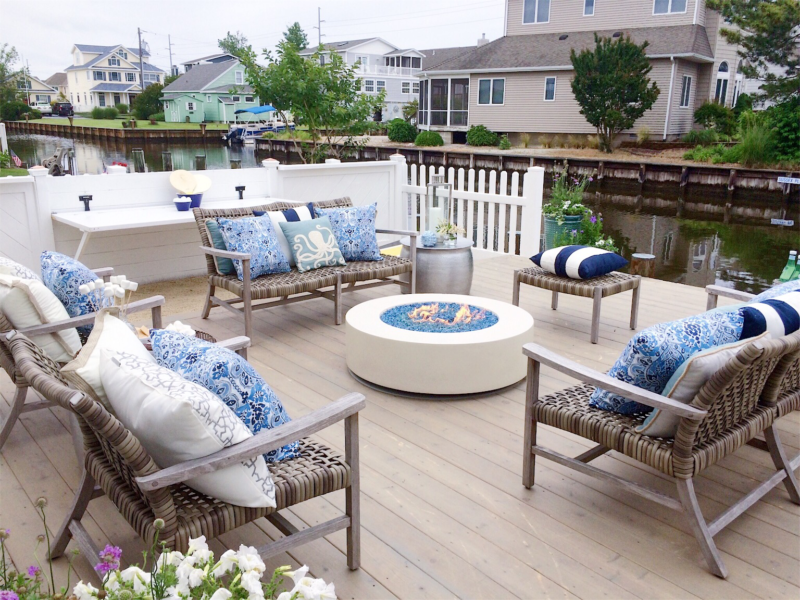 The new deck transformed Chris and Jay’s backyard into an inviting, functional, waterfront retreat. 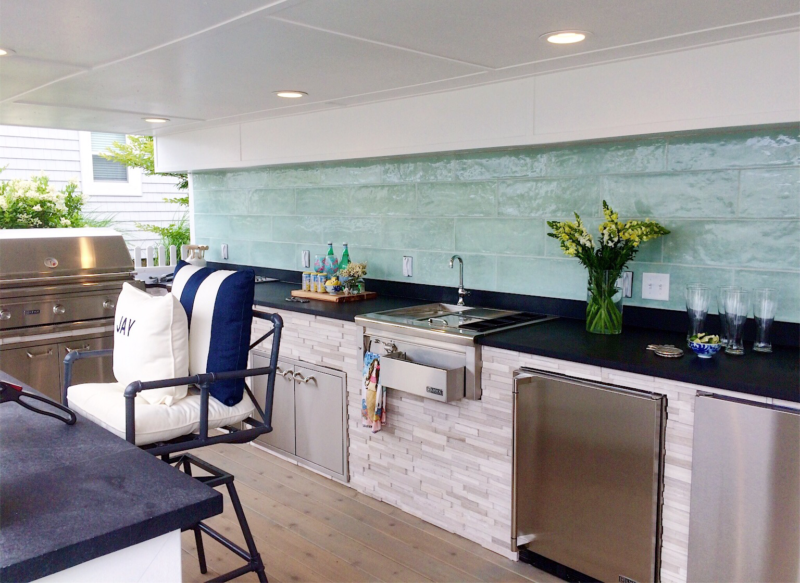 The new kitchen features a top-of-the-line grill, range, sink, refrigerator, and a kegerator all in high-gauge, weather-resistant stainless steel. We also created a bar/countertop area for eating, serving, and entertaining, and added overhead lighting and plenty of built-in storage. The soapstone countertops are as stunning as they are durable, and provide striking contrast with the rest of the space. 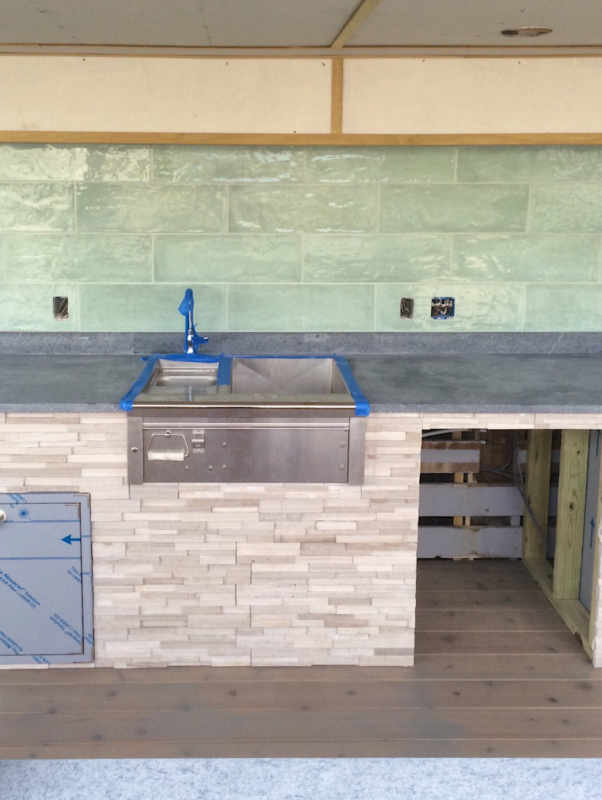 Lastly, I added a backsplash accent in a watery blue-green to mimic the water just a few steps away (with a light gray grout that virtually disappears into the tile). I broke up the rest of the deck by creating different zones that serve distinct purposes. Right in front of the kitchen is the new dining area. A large-scale patterned rug anchors the space, and a long wood table provides generous seating for Chris and Jay’s guests. Just off the dining area is the new outdoor living room. Beach life is as much about doing as it is about relaxing, and this is the perfect space to do so. 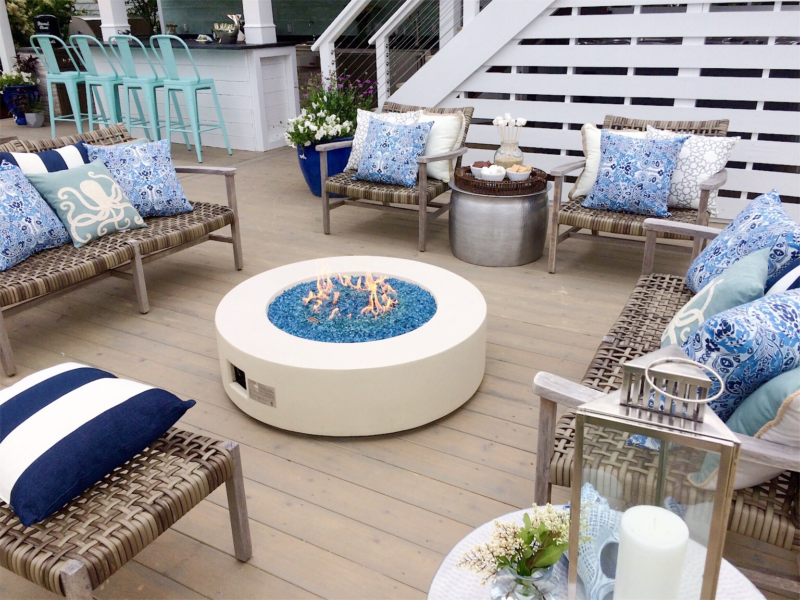 The ample seating is piled high with comfy, nautical-inspired pillows; an ottoman and small tables provide plenty of places to rest a drink or tired feet; and the propane fire pit is not only a fantastic visual element, but it also offers a place to warm up on cool nights (and hello, s’mores!). Lastly, we finished the entire space with bright, hardy landscaping and surrounded it with privacy screens with built-in drink ledges. There was also enough space to create a game area where the family can play corn hole or beer pong on a fold-away ping pong table. 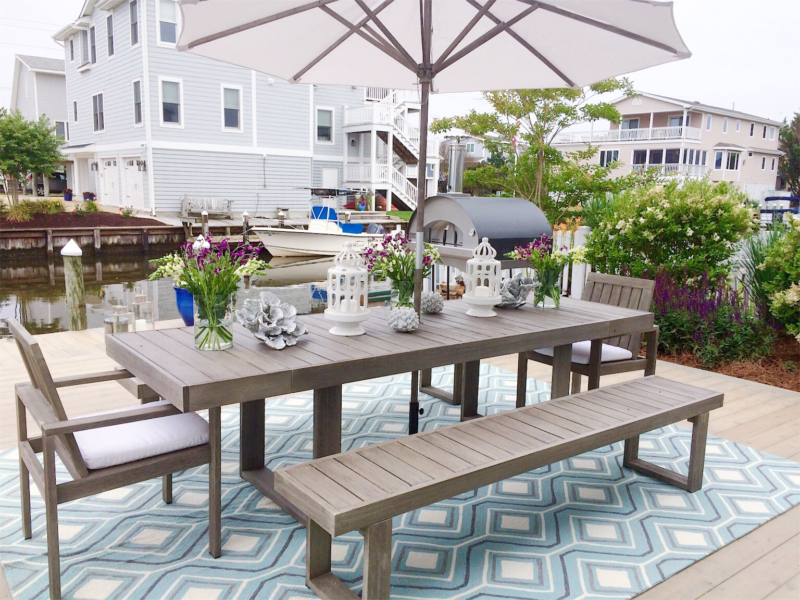 The final result is an expansive, inviting space full of coastal charm that is ideal for eating, entertaining, and relaxing. Chris and Jay finally have a backyard retreat that their children will love visiting and that takes advantage of life on the waterfront. See more of behind the builds on all of my episode recaps. 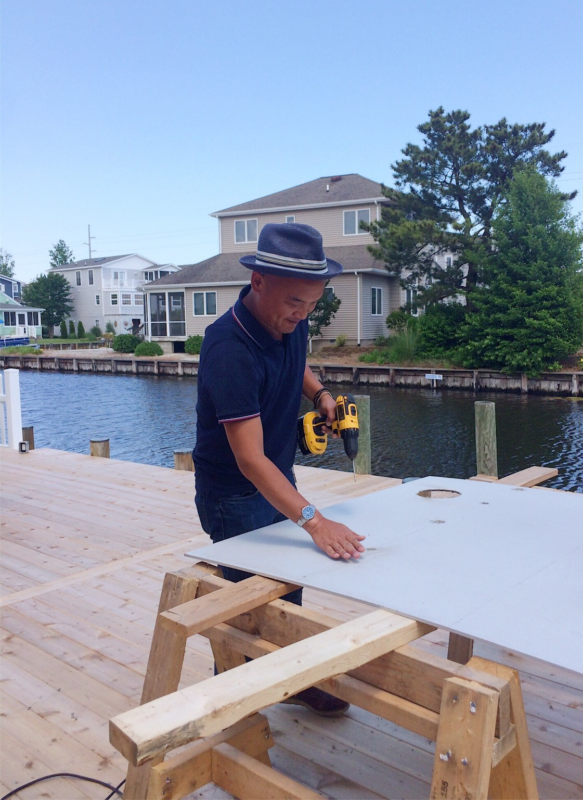 And tune in for two brand new episodes of #BigBeachBuilds every Monday night at 9/8c on DIY Network (tune in an hour early to catch the previous week’s episodes)!